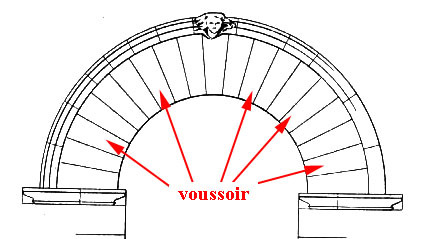 voussoirs: SCHOOL OF ARCHITECTURE HITS WALL? SCHOOL OF ARCHITECTURE HITS WALL? While browsing the Internet, the question about events at the Univeristy of Queensland School of Architecture came to mind. What was going on there these days? It had been some time since I had been there. So the site was opened. Mmmm . . . the Venice Biennale. Interesting. I remembered when a Queensland University of Technology staff member - now at the U of Q - arranged an exhibition at the Biennale some years ago. He used the local corrugated iron as the theme to show things Australian. One assumes that this is the intent of participating at the Biennale. Russell Hall played an important part in this exhibition with his unique corrugated iron designs - or is it corrugated 'steel' these days? The exhibition was truly something unique to this southern island country - the antipodies. Even the iconic Southern Cross wind mills played an important part in the display that was well received by visitors. 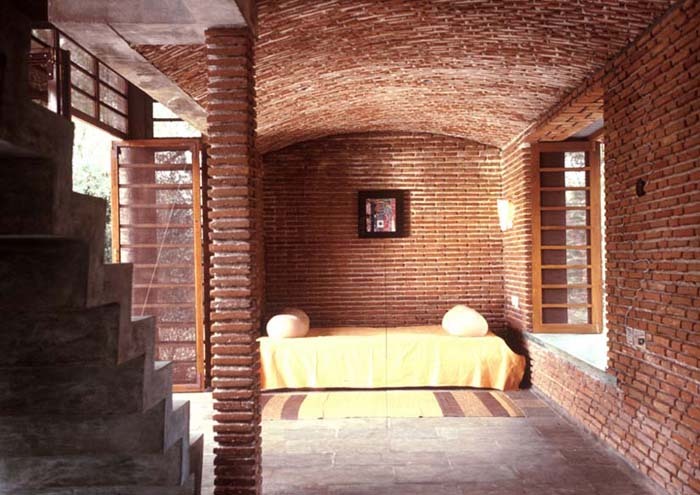 This time there was something different by Dr. Anupama Kundoo: a 1:1 model of the Wall House. Does this mean a full-sized replica of the house? The text concealed the image of what one assumed might have been the Wall House - possibly the replica? - but it was difficult to see. 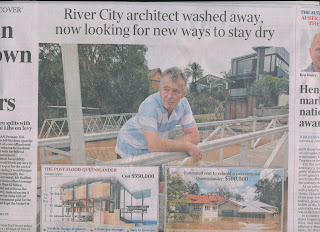 So the Wall House was Googled in order to find out more about this place that had been selected to represent 'UQ Architecture on (the) International stage' and become the headline item on its' web site. The images reminded one of Le Corbusier's Maisons Jaoul in Paris, with some lingering touch of Louis Kahn in Dacca; and the empty Harry Seidler architectural interiors that were always photographed with a strategically located unique item placed 'architecturally' just for the shot. Here the innovation lies in the definition of the building program for a residential house, as well as the transition spaces between the inside and outside. Borders and transitional spaces are defined in a new way. The attention paid to these spaces creates a deliberate and, if desired, flexible buffer space that can change the territorial enclosure according to the changing time of day or climate. Trees are integrated to create further spatial compositions and a smoother transition to the nature at large. The stepped terracing continues from the surrounding terrain, penetrates through and through the house and continues on to the other side. The outside penetrates the inside so to speak. The program for the transition spaces is larger than the enclosed spaces. 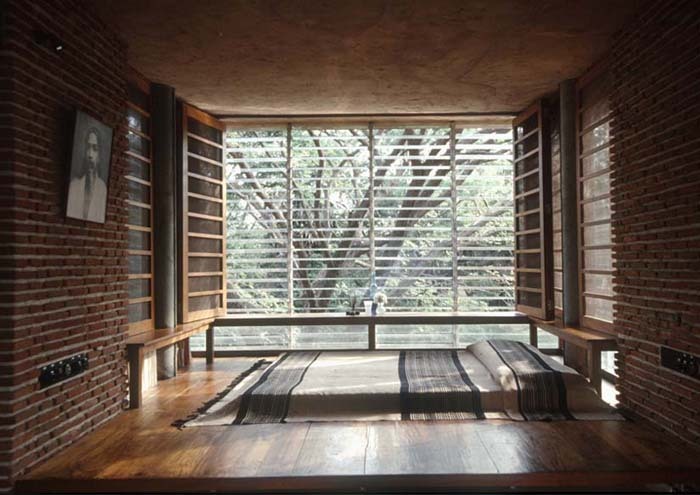 The window shutters are a series of options that can be seasonally regulated just as we do with our clothes for providing climatic comfort. The result is a skin that is alive and breathes, and an architecture that is dynamic and responsive to the changing human needs and comfort. An example of an activity in the transitional space is the dining area. The dining table is built out of a single log of rosewood, which nearly extinct now, and by using no other material even for its joinery. The table is formed so that it can be reassembled to gain the whole log with no wastage. 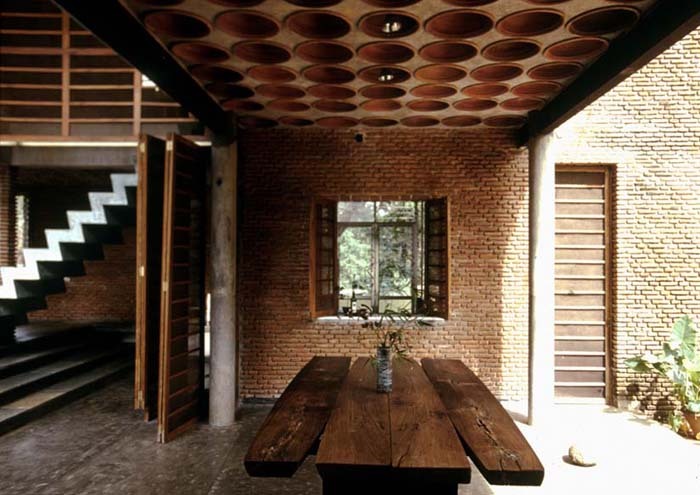 The floor slab above is also innovative. Terracotta pots used in the local area for cooking, with their use diminishing, has been used as a form work for concrete in an area with no tradition of form-work. The already reduced energy demands of the house through application of solar passive principles are entirely met by solar photovoltaics for electricity, solar water heater as well as solar pump for water pumping. I don't know if I really understand some of this blurb, but it is interesting. Just why the reassembly of a log is useful is as puzzling as some of the other concepts. 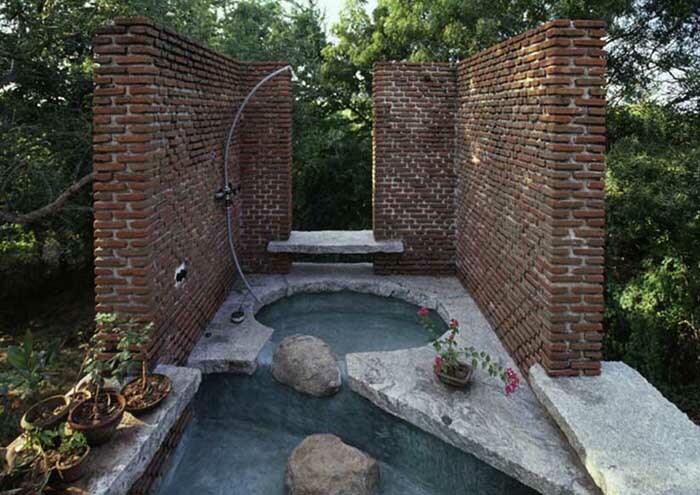 But what has all of this to do with U of Q School of Architecture? There is no mention of the U of Q School here. Did it have an involvement? A look at the School of Architecture list of academic staff members seemed to explain things. 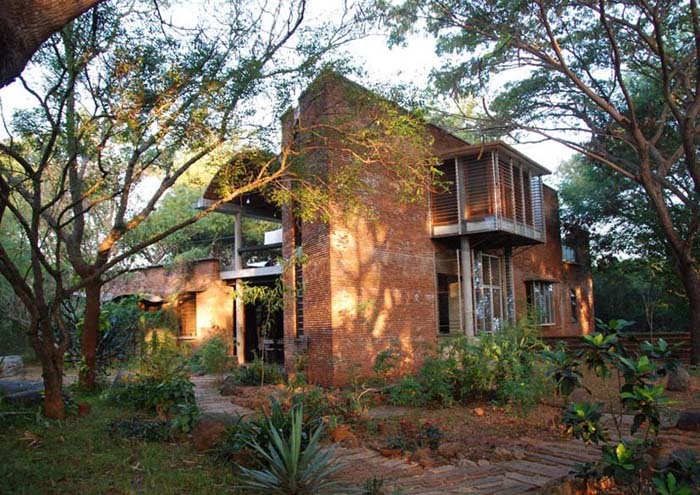 So the Indian Architect, Anupama Kundoo, is one of the staff. 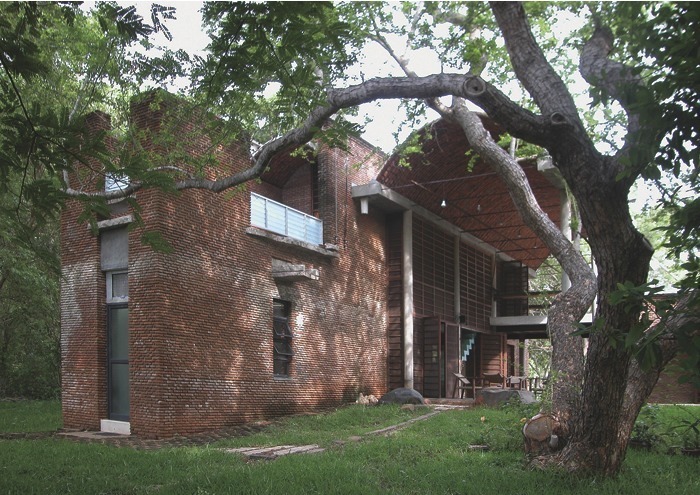 This clarified the link to the twelve-year old house in India, but it did not help understand how this building had become the icon of this school, sufficient to have a full-szied copy of it erected to showcase the school to the world. 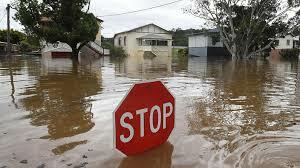 Has Australia nothing to talk about? 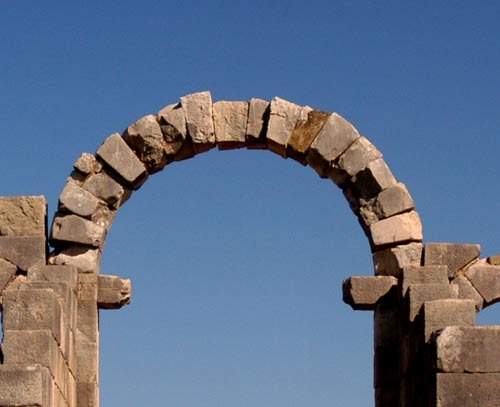 Has the school hit the wall? Hopefully we are not indulging in the old perception that things from elsewhere are always better - even old things? Then another matter occurred to me: there was a time when the prerequiste for undertaking an architectural course included the requirement for english, maths, science and art. Over the years this got whittled down to just english. One wonders now if the requirement has become only to have a tablet - of course, this would have to be an iPod: cool dedsign, as the judge said. Still, the first question lingers: just what is happening at the school? Surely something interesting has happened in the last twelve years?